The 1997 Model Year E38 is equipped with EWS III (3.2) drive away protection. E39 vehicles produced 3/97 and later are also equipped with EWS III (3.2). The major changes of the EWS III (3.2) system over the EWS II are a modified control module, revised wiring and the addition of the clutch switch input. Output functions, starter control and ISN signal, remain the same for EWS III (3.2). •	EWS III (3.2) Control Module. •	Input From The K-Bus. The EWS III (3.2) Control Module has a 13 pin connector. The transmitter/receiver module is no longer a separate module of the system with the electronic functions for the data transfer between the key transponder and the EWS control module being handled directly by the EWS III (3.2) control module. The vehicle wiring harness has been changed to reflect this modification and to route the wiring from the ring antenna directly to the EWS III (3.2) control module. • Lock and Unlock Requests. • Range Selector Position (Redundant Signal). The DME outputs the engine speed (TD) signal over the CAN Bus to the IKE. The IKE uses the TD information as needed and passes it on to the EWS III (3.2) via the K-Bus. The lock and unlock information arrives at the GM over the P-Bus from the door module and sent via the K-Bus to the EWS III (3.2) control module. This information informs the EWS control module the lock status of the vehicle (lock/double lock). The EWS III (3.2) control module signals the GM over the K-Bus that an authorized key has been recognized and requests the doors be removed from the double lock position. The code function status arrives at the EWS control module over the K-Bus. This information allows/disallows vehicle operation based on code status. If a code has been set and entered correctly during the start-up, the vehicle will operate normally based on the other inputs. Entering the code incorrectly will prevent vehicle operation. Range selector position is still provided directly to the EWS III (3.2) control module from the Transmission Range Selector Switch. Redundant information is provided over the K-Bus in case of loss of signal from the range switch. A Hall-Effect Switch is added to the clutch system to inform the EWS III (3.2) control module of clutch status. Input from the switch replaces the signal from the Trans Range Selector Switch on manual transmission equipped vehicles. High signal status indicates the clutch is depressed and vehicle starting is allowed. EWS III (3.2) system operations. • The key is inserted into the lock cylinder and switched (ON). The EWS III control module is powered through KL R and sends a 125 kHz AM signal to the ring antenna. The AM signal induces voltage in the key coil and powers up the transponder. • Powered up, the key transponder sends the key identification code to the EWS III module. The EWS III module verifies the key identification code and checks to see if the key is enabled. If the key is correct and enabled, a password is sent to the transponder over the 125 kHz AM signal through the ring antenna. • When the transponders accepts the password, it releases the changing code, which it received from the EWS III module during the last start-up operation, to the EWS III module via the ring antenna. • The EWS III module compares the changing code received from the transponder with the code stored in its memory and if they match the process is allowed to continue. The EWS III module looks at the other inputs for correct status (e.g. Code function not active, Transmission in P or N or clutch depressed, engine speed below specified RPM) and energizes the internal relay to begin starter operation. • As the starter begins to operate, the EWS III module sends the ISN to the DME and if verified as correct by the DME, drive away protection is cancelled and injection and ignition is enabled. The EWS III module also sends a new changing code to the key transponder through the ring antenna. Up to 6 additional keys may be ordered as replacement keys. The EWS III (3.2) module is codeable for only 10 keys (4 delivered with vehicle and 6 replacement). The keys are mechanically matched to the vehicle with the lock tumblers and electronically matched to the EWS III (3.2) through unalterable coding. EWS III modules from other vehicles will result in the keys not being recognized. The EWS III (3.2) control module stores the ZCS coding and must be coded at time of installation. The module must be aligned with the DME so that it stores the correct ISN. There is no limit to the number of times the ISN may be changed in the EWS III module. 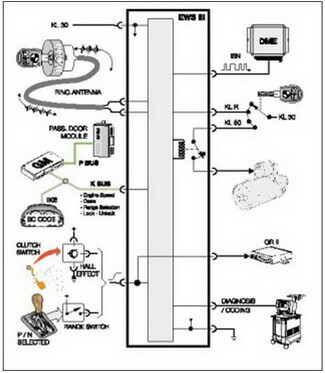 DME Control Modules are (off the shelf) parts requiring programming during installation. The ISN of the DME is not changeable and must be transferred to the EWS III (3.2) module. Keys that are lost or stolen may be deactivated or made to not operate the starter functions. The SERVICE FUNCTIONS of AutoHex Diagnostic scanner for EWS III (3.2) contains a (Bar/Release Code) function that activates and deactivates keys of the EWS III (3.2). Any key may be (Barred) except the key in the ignition at the time of deactivation. The lost or stolen key can be identified by the identification of the remaining keys. There is no limit to the number of times a key can be activated/deactivated.